The city of Alexander Bay in the north-west of South Africa has experienced what I call a real sandstorm. Within minutes, everything was covered by a wall of sand… And the landscape began to turn red, like Mars… Very unusual storm for the region! Rare sandstorm turns the sky of Alexander Bay, South Africa blood red. 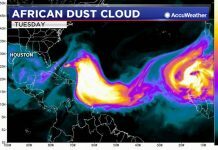 Apocalypse? Not just yet. 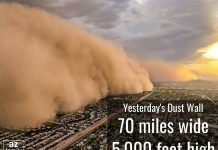 But some may have believed it was the end of the world when Alexander Bay in the Northern Cape was hit by a red dust storm on Sunday morning. The South African Weather Service had issued a warning of strong gale force winds over the weekend along the West Coast. 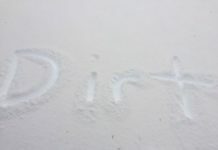 The storm was caused by “very strong offshore winds” and the red dust was due to the type of soil in the area. The wind averaged between 48 and 56km/h on Sunday morning for Alexander Bay with gust between 68 and 75km/h. The highest gust was 95.6km/h in Alexander Bay. Storms such as this one are not usual except when weather conditions are favourable. 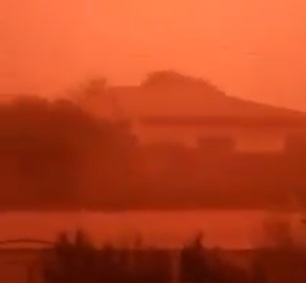 This apocalyptical sandstorm turned the sky blood red!